John de Lancie is an American actor, producer, writer and musician. John has been a member of The American Shakespeare Festival, The Seattle Repertory Company, South Coast Repertory, The Mark Taper Forum, and the Old Globe where he recently performed Arthur Miller’s Resurrection Blues. He has appeared in numerous television shows including; The Six Million Dollar Man, Hill Street Blues, The Thorn Birds, Nero Wolfe, The West Wing, Sports Night, Judging Amy, The New Twilight Zone, The Closer, Legend, L.A. Law, MacGyver, Picket Fences, Civil Wars, The Practice, Charmed, Murder, She Wrote, Stargate SG-1, Battlestar Galactica (1978), Emergency!, Touched by an Angel, Law & Order: LA, Invader Zim, etc. He Will also star in the eighth episode of Torchwood, Miracle Day. De Lancie is best known for his portrayal of the iconic, all-powerful Q, a recurring character on Star Trek: The Next Generation. Q is one of few characters appearing in multiple shows of the Star Trek franchise. He also co-starred in Star Trek writer Michael Piller’s short-lived creation Legend as eccentric scientist Janos Bartok. He had a recurring role as NID Colonel Frank Simmons on Stargate SG-1. He has also appeared as Beka Valentine’s Uncle Sid in Gene Roddenberry’s Andromeda, as pollster Al Kiefer on The West Wing, and as an Elder on Charmed. His film credits include The Hand that Rocks the Cradle, Get Smart, Again!, The Fisher King, Bad Influence, The Onion Field, Taking Care of Business, Fearless, Arcade, Multiplicity, Woman on Top, Nicolas, Good Advice, Patient 14, The Big Time, Teenius, Pathology, Evolver, and Reign Over Me, You Lucky Dog (1998). He also had a small voice part in Saving Private Ryan (1998). 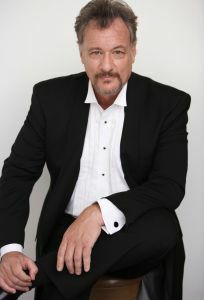 De Lancie has performed and directed for Los Angeles Theater Works, the producing arm of KCRW-FM and National Public Radio, where the series The Play’s the Thing originates. He recently returned from a national tour of the Scopes Monkey Trial. De Lancie was the narrator for a General Motors (GM) commercial in the early 1980s that featured a robot that drops a bolt and talks about the future of the auto industry and in 1997 lent his voice to The Real Adventures of Jonny Quest as Doctor Quest. He voiced the villain Sinestro on the “The Green Loontern” episode of Duck Dodgers, as well as French mercenary L’Etranger on Max Steel. De Lancie provided the voice of the character Antonio Malochio in the PC game Interstate ’76, as the angel Trias in the video game Planescape: Torment, and as Dr. Death in Outlaws. He also played Q in the PC Video Games Star Trek: Borg and Star Trek: The Game Show. Star Trek: The Music was a multi-city tour with Robert Picardo. De Lancie and Picardo narrate around the orchestral performance, explaining the history of the music in Star Trek. De Lancie produced, co-wrote, directed and narrated, together with Leonard Nimoy, several audio dramatizations of The Time Machine, A Journey to the Center of the Earth, The Lost World, The Invisible Man, and The First Men in the Moon, as well as three television specials for the Sci-Fi Channel. In addition, he played the lead in Yuri Rasovsky’s award-winning audio version of The Cabinet of Dr. Caligari. He also narrated the show “Black Holes”, an educational show produced by the Clark Planetarium for use in full dome planetarium star theaters.